The office closes early today! Yeah for Christmas! 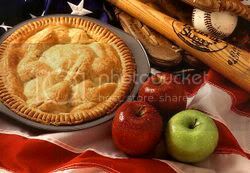 I plan on spending the rest of the day finishing up my shopping (what do you get your sister-in-law?) and baking some desserts from yesterday's Desserts post. I am leaning towards the PB&J cookies after Ali's review of them. If you're still trying to decide what to make for Christmas dinner, don't forget to check out Rachael Ray's Christmas dinner recipes from her Christmas in 60 show. You can also see all of the posts from the A Rachael Ray Christmas series by clicking on the Holidays label in the left-hand sidebar. 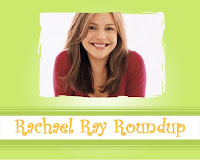 If you write a post about Rachael Ray, her recipes, or her travel picks, please drop me a line at everythingrachaelray at gmail dot com so I can make sure it gets included in the Roundup. Merry Christmas and Happy Holidays! The Chicago Tribune reveals that Rachael surprised fans by stopping by Chicago's Kitsch'n. She "held court for almost an hour, posing for pictures and handing out copies of her latest cookbook, Rachael Ray 2, 4, 6, 8: Great Meals for Couples or Crowds. Celebrity Dog Watcher tracked down more information about Rachael's dog Isaboo. The Home Cook at Taste of Home tried several Rachael Ray recipes this week including: Turkey and Spinach Meatballs and Cream of Mushroom Casserole. Angela M. at Shelterrific tried Rachael Ray’s Sweet Potato and Sausage Hash, which is one of my favorites. She says the fresh salsa is a must (I am usually to undermotivated to make it). Wes Thorpe is glad to see some balance in the Rachael Ray universe. My pleasure, Wes! Ana at Kitchen Space adapted a recipe from Every Day With Rachael Ray: Parmesan Crusted Tilapia. The roasted veggies and spinach fettuccine that she served with it look good too! There's a very interesting post about autograph dealers and how Rachael Ray tried to thwart them by Hugh at Confessions of a Paparazzi. The Boston Globe provides some Tasty Travels gossip; Rachael was in Boston filming the show Rachael Ray was in Boston December 20 shooting segments "at chef Ken Oringer's South End hotspot, Toro."